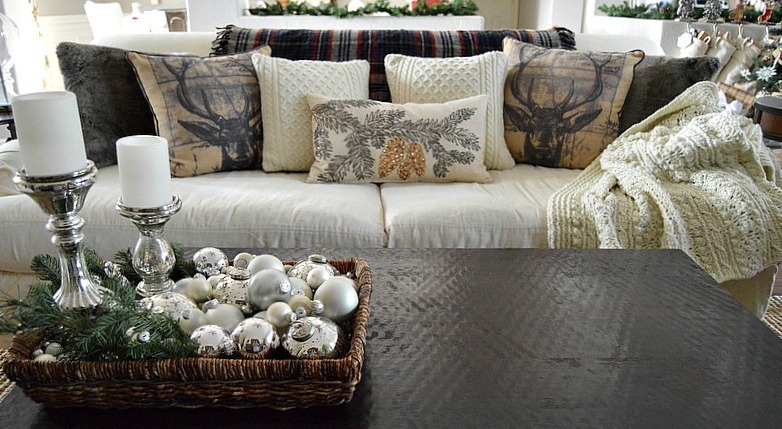 Hello – welcome to Part One of our Holiday Home Tour (you can see Part 2 here)! I’m so excited to be joining Kendra from Joy In Our Home, and 19 other talented bloggers, on this festive, inspirational, Holiday Home Tour! 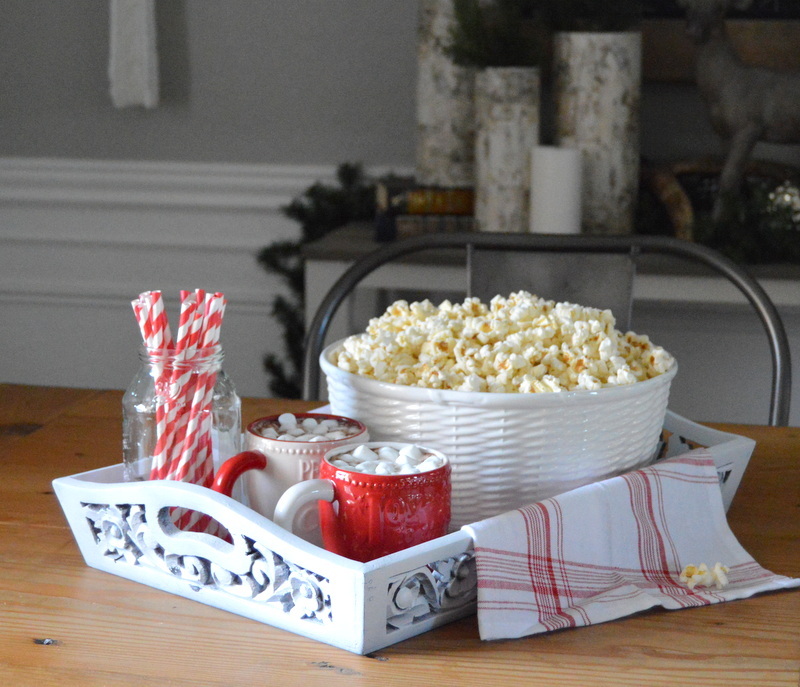 (I’m also linking up to Jen Rizzo’s Holiday House Walk Link Party). Whether you’re a regular reader, or just stopping in for the tour – I’m so glad you’re here! For those of you who are new, I’m Amy and I live in a small, rural community on the outskirts of Phoenix, Arizona with my husband, two kids, and four pets. We bought our house a year and a half ago and have been working hard to make it comfortable and functional for the way we live. We’re a busy family on a tight budget, so progress has been slow, and we’ve had to get resourceful when it comes to furnishings and home improvement projects. This is officially our second Christmas in this home and we’ve taken the same resourceful approach to our holiday decorating. Our home is an open-concept floor-plan and the main living areas (kitchen, great room, entryway and dining room) all flow together so I tried to make sure the decor transitioned easily from one space to the next. 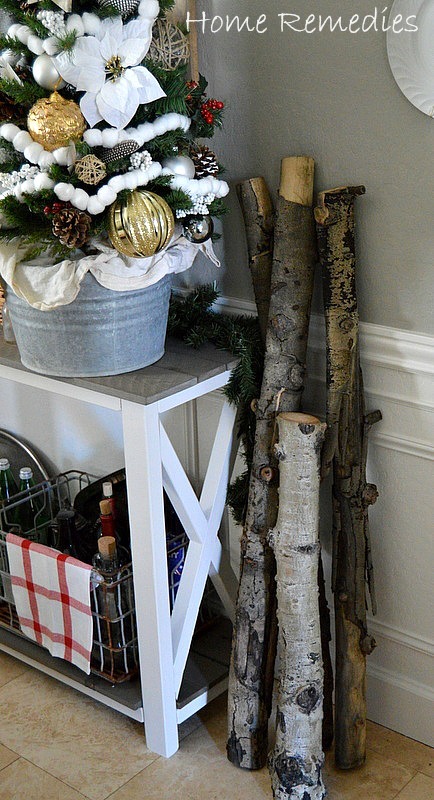 Our entryway is where we greet holiday guests and I wanted it to feel welcoming. Some simple garland, a handmade wreath, a cozy fur blanket and a couple of comfy pillows are all it took to cozy up the space. 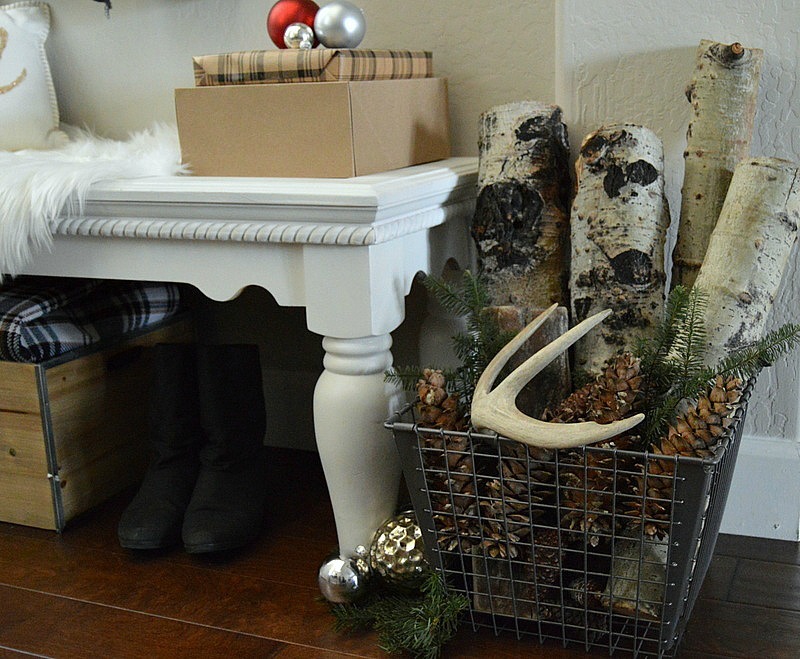 Some birch logs, antlers, and pine-cones in a sturdy metal basket lend a rustic feel and balance out the softer elements. Our family/great room is where you’ll find us hanging out most often; watching holiday movies, playing games, or relaxing on the sofa. A couple of new pillows are mixed in with the sweater pillows I made last Christmas, and the fur pillows I purchased earlier in the fall. 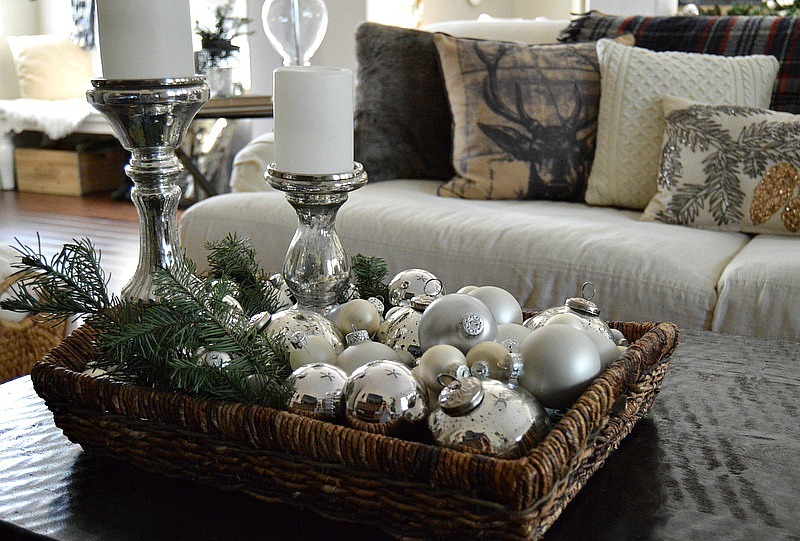 The wicker basket on the coffee table is dressed up with mercury glass candle holders and ornaments, adding a little sparkle to the space. 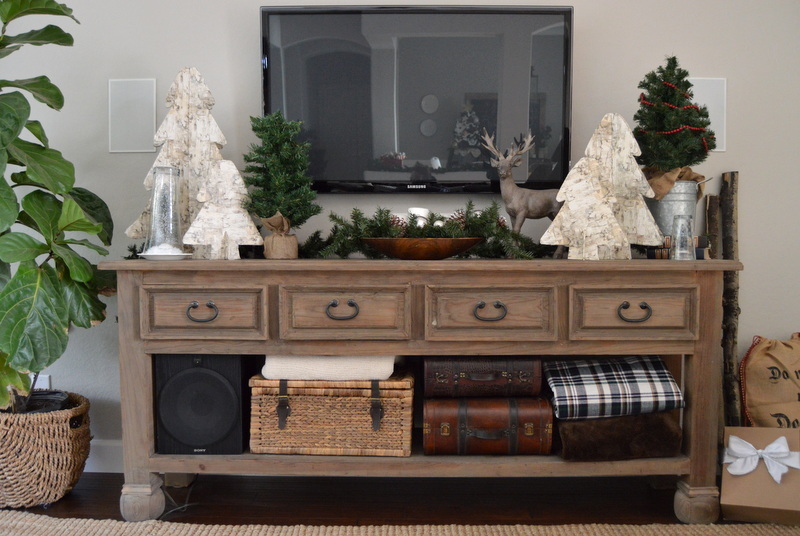 The entertainment unit holds some greenery, rustic trees, and a couple of the up-cycled holiday trees I used for a centerpiece vignette a couple of weeks ago (click here to read about it). 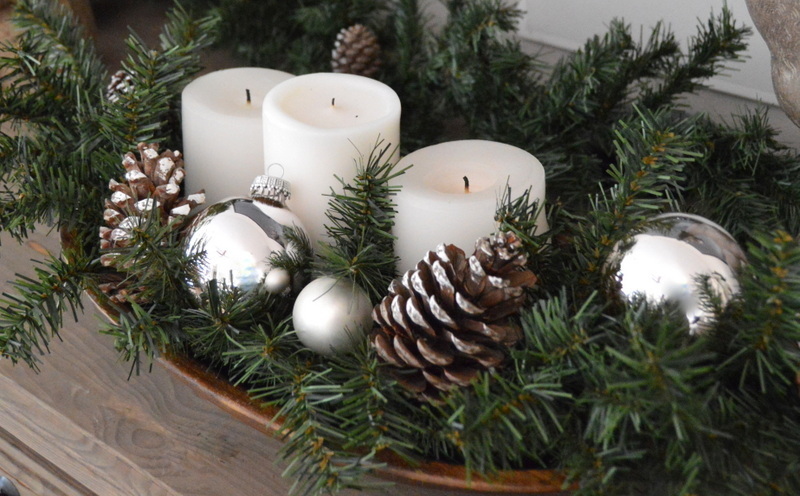 Greenery, simple white candles, pine-cones, and sparkly ornaments in a wooden bowl make an easy table-top display. Our dining room also got the rustic-glam treatment. 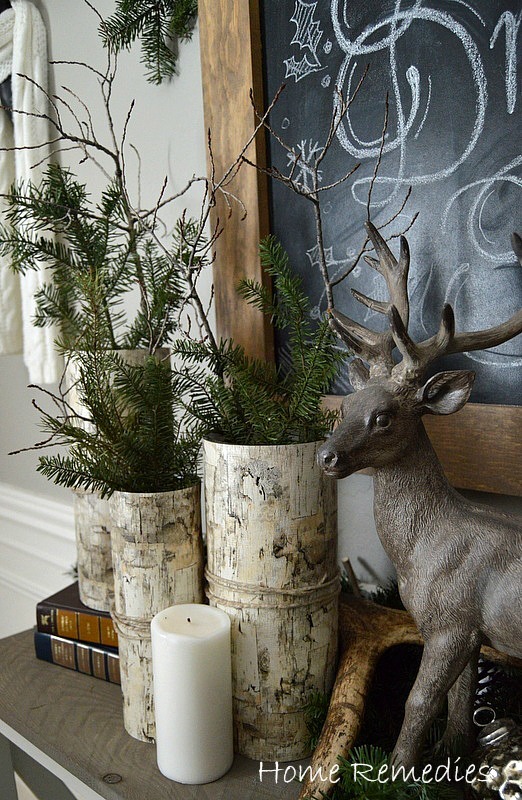 More pine-cones, greenery, and antlers adorn the sideboard, along with some vases wrapped in birch-bark gift wrapping paper and bits of twine. 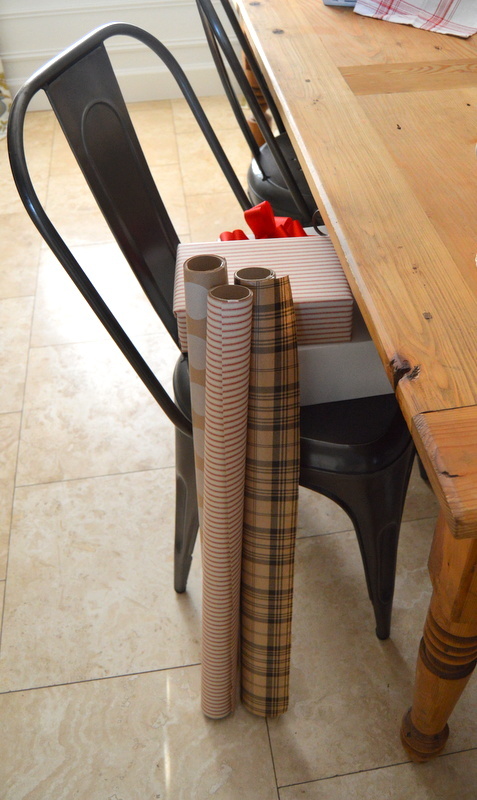 The dining room table also serves as gift-wrap central this time of year. I’m not alone in this, am I? And this guy, watching over the festivities. 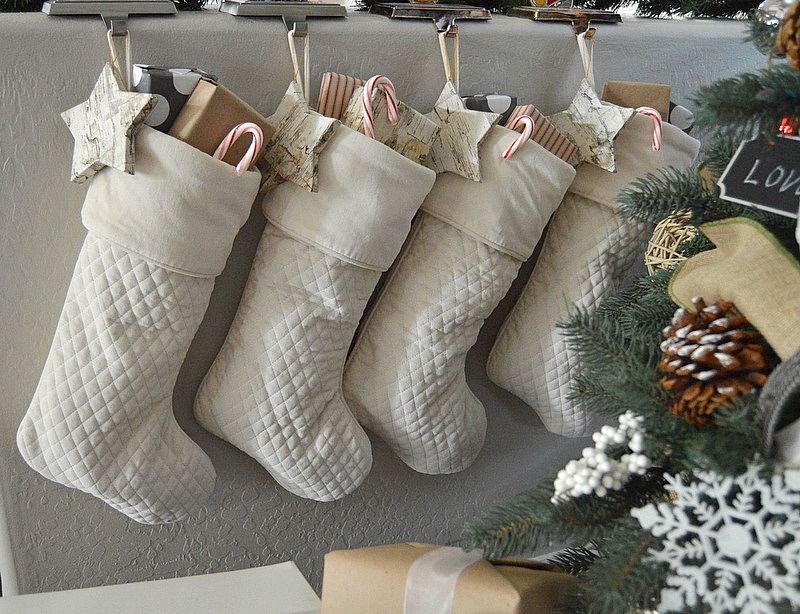 We don’t have a fireplace or mantle, so the stockings have been hung on the half wall that separates the kitchen from the great room. Hmmm… looks like we’ve all been good this year! 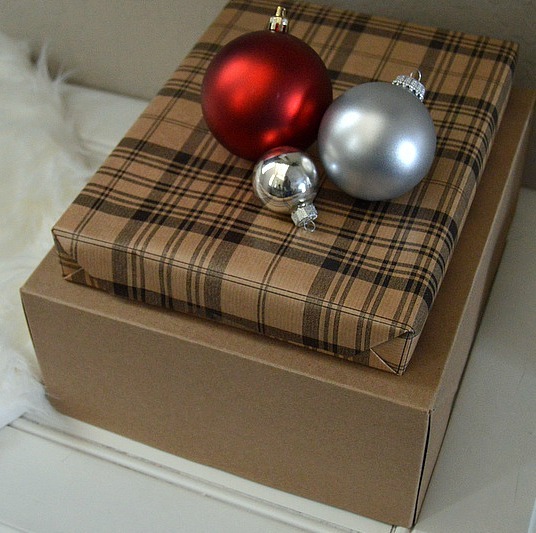 A faux fur rug acts as a tree skirt and is the perfect spot for our wooden crate advent calendar, which helps fill up the empty space until Santa brings the rest of the gifts in a couple of weeks. Thank you so much for stopping by! 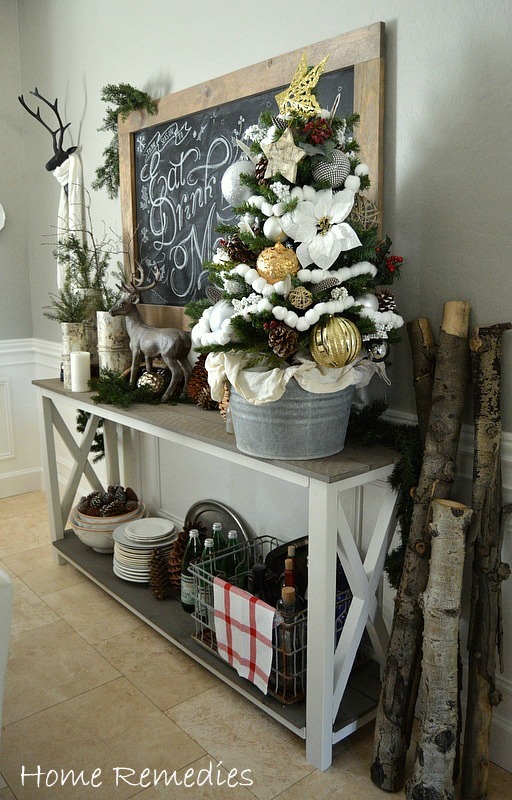 There’s still plenty more to see in the Holiday Home Tour – just click on the links below to visit some of the most creative and talented bloggers ever, with homes all decked out for the holidays! 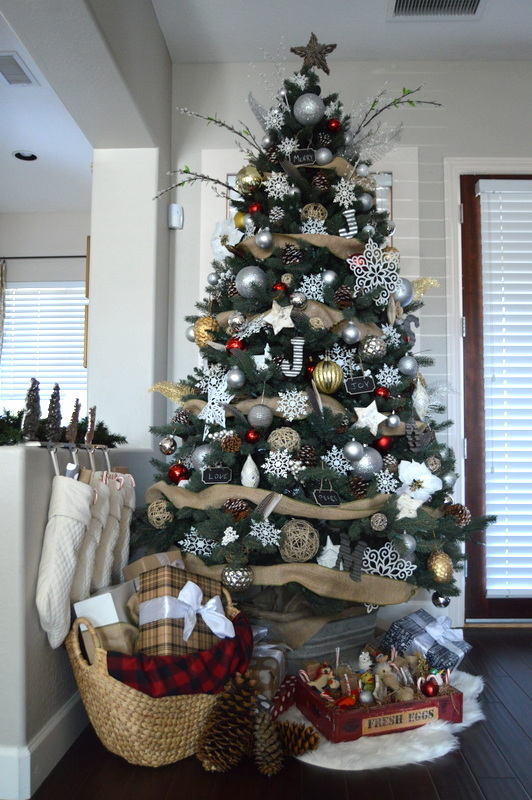 And if you’d like to see more of my home, check out Part 2 of my Christmas Home Tour here! Oh my heavens! Your home is perfection! If that’s what you do on a budget…..
You need to add your tour to Jennifer Rizzo’s link to be considered for next year gal! You’re too sweet, Karen! I’ll definitely link up to Jen’s party – thank you for the reminder! So glad you stopped by! Your home looks beautiful Amy!! 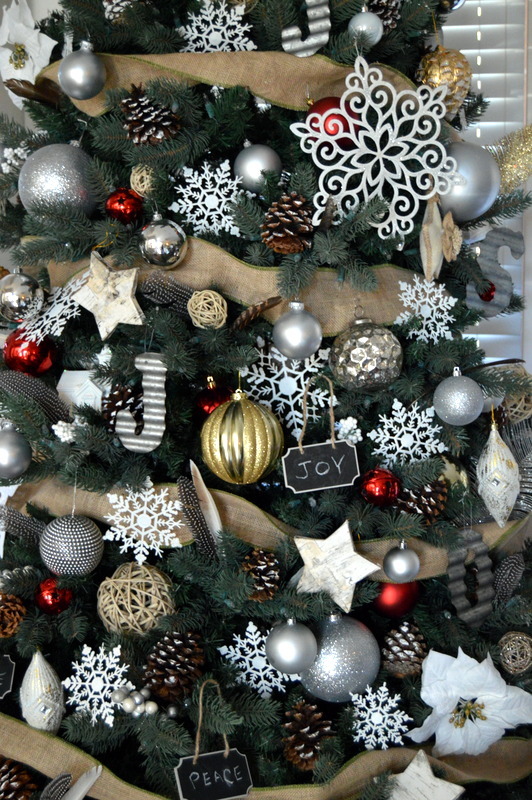 I love how your entry way is decked out for the holidays! And you must tell your daughter her chalkboard writing skills are amazing It looks beautiful!! 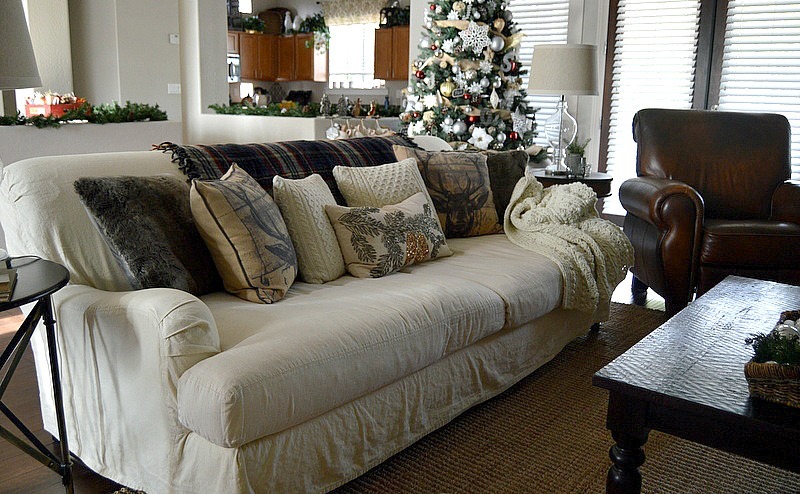 Your pillows make your living room couch look so cozy!! Thanks so much for sharing… so glad to have you as a part of this tour! Thank you so much, Kendra! It has been so much fun “touring” with you – and the rest of the gals, too! I’m so grateful for the invite! Amy, your home is absolutely beautiful! You’ve done an outstanding job decorating for Christmas. My personal fav is the entry. Just beautiful! Thanks for sharing it with us! I’m so glad you like my home, Iris! It’s been fun doing this tour, hasn’t it? Thank you for your kind comments, and for visiting! Thank you, Nicole! I love having a little tree in the dining room, it just feels so festive! Thanks so much for stopping by! Amy, this is so beautiful! It’s so warm and inviting. It’s the perfect combination of rustic and glam. I love it! The dining room is my favorite. I love your sideboard and chalkboard. Your daughter is very talented! 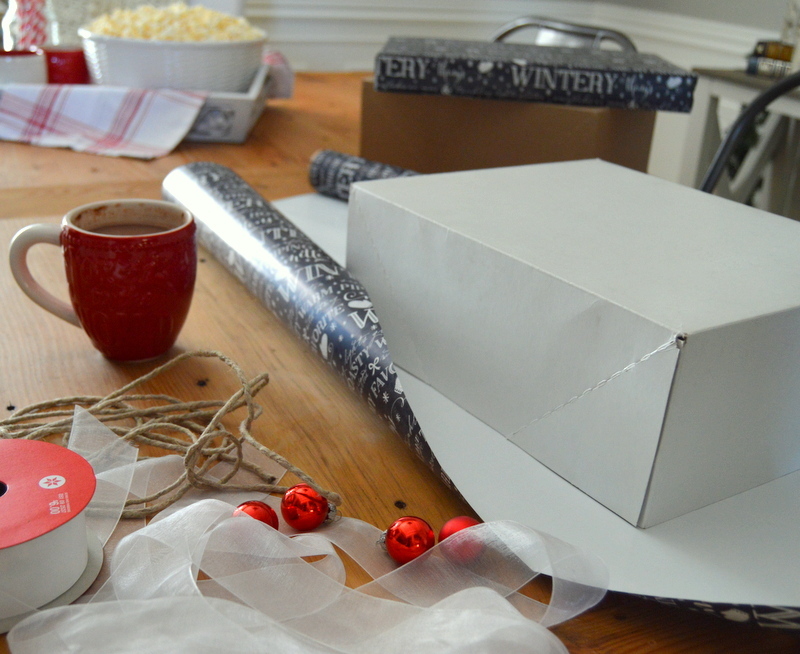 I never would have guessed the vases are covered with wrapping paper. Clever idea! And the reindeer with the scarf is just too cute! Merry Christmas! Wow! You did a wonderful job-all your decorations flow together so well! And I especially love your Christmas tree and the scarf around the deer head! So happy to be part of the home tour with you! Thank you, Michelle! I’m so glad to be “on tour” with you, too! You are too darn sweet, Christine! Thank you so much for the kind words, my friend! My home is ever-evolving; as are my photography skills, but it’s all about the journey, for me! Thanks so much for stopping by (and for fixing my link)! Love, love, love the entryway so much! Such a cozy home! You do neutrals well!! Thank you, Andrea! I loved your home tour, as well! Thanks so much for stopping by, and for the sweet comments! ohhh question, I spy greyish fur pillows on your wite sofa, are those from WM? Cuz I just bought them too????? Yes, they are, Christine! We love them – they are sooooo soft! Hi Christine – so glad you stopped by! 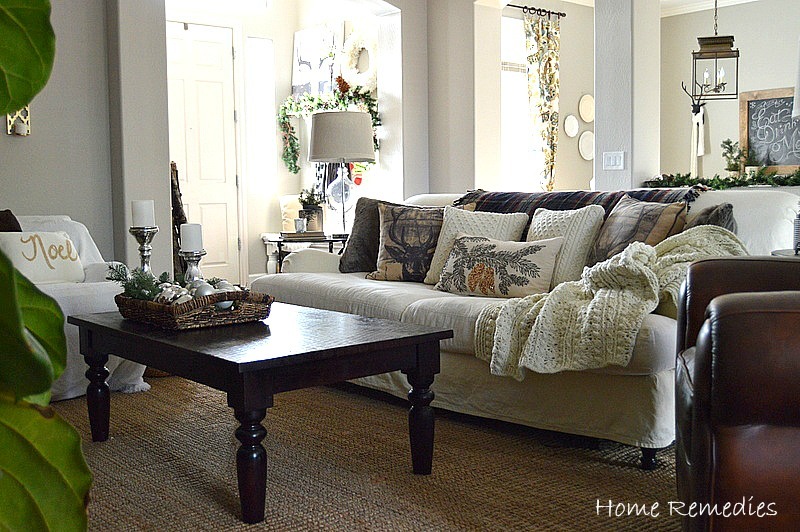 Yes, the grey fur pillows are from World Market – I absolutely love them! 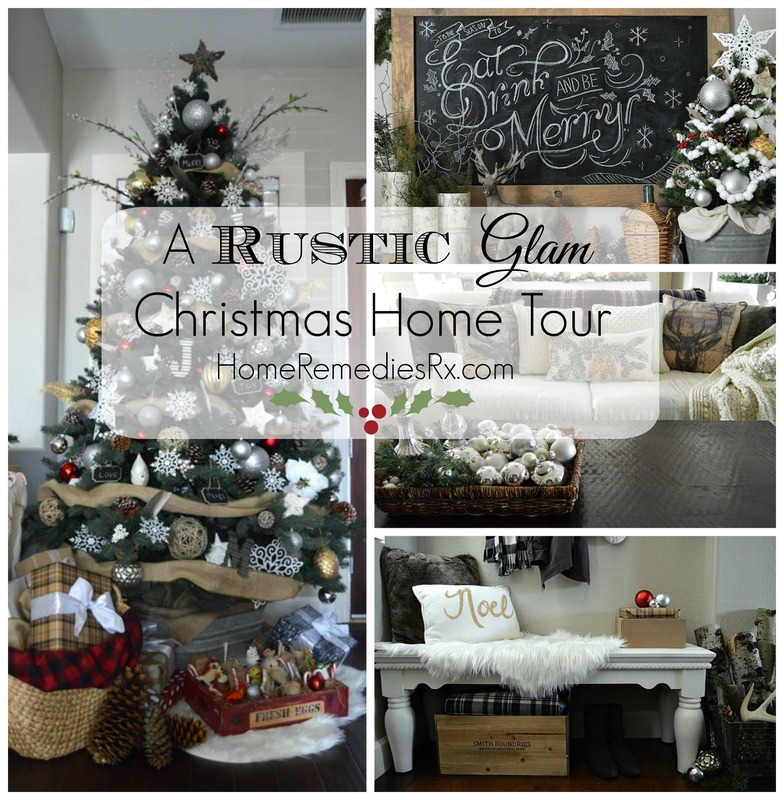 I really love everything about your beautiful Christmas home! 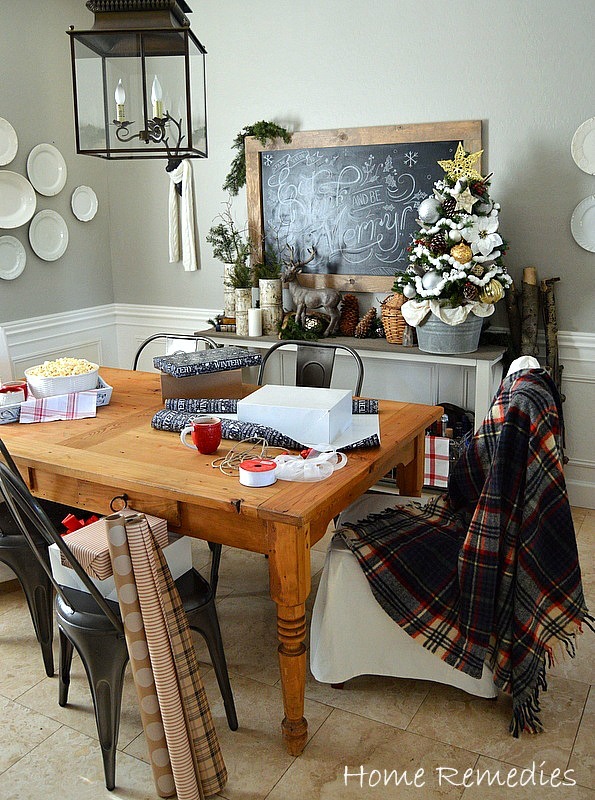 The birch logs are a nice touch, and your daughter has some serious artistic talent with that chalkboard! Thank you, Rebekah! I’m glad you enjoyed the tour! My daughter will be happy to know her artwork is appreciated – she seems to think it looks a little “wonky”! Thanks so much for stopping by! I love your home. I really LOVE your chalkboard. I am part of this home tour too and I did some chalkboard art as well, but I want your daughter to come do mine from now on. She is talented! I love it. I loved your home tour, Shambray! 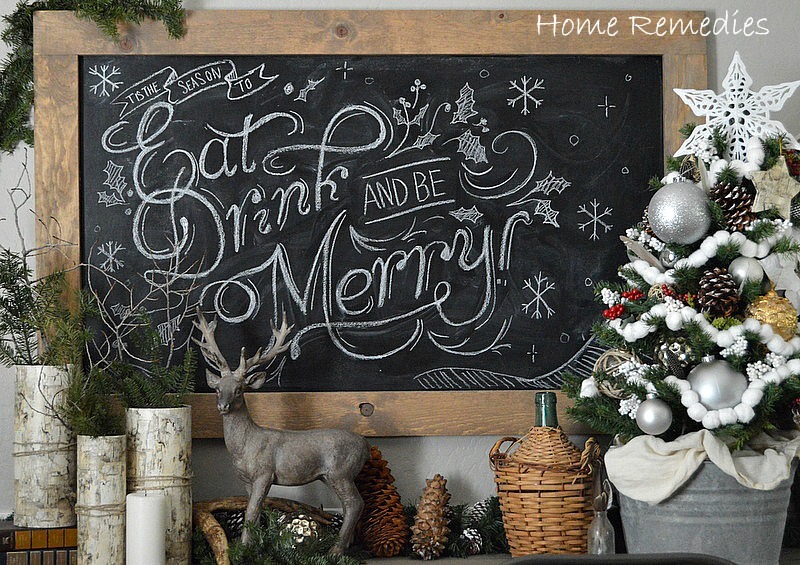 And your chalkboard art looks fantastic! So glad to have “met” you through this tour – it has been so much fun! Thank you for taking the time to stop by my little blog and leave your sweet comments! Tania recently posted…Master Bedroom Redo – Repainting and A Surprise Accent Wall! Thank you, Tania! I love the scarf, too! So glad you stopped by! SO much to love that I’m not even sure where to start. 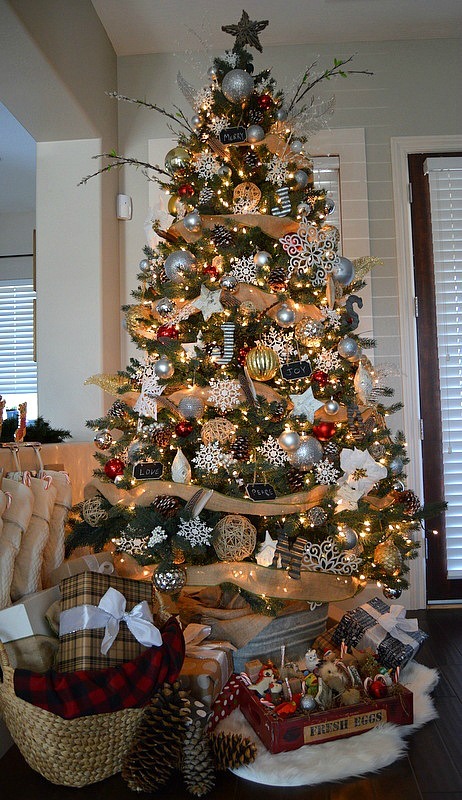 The mini tree in your dining room is beautiful and I love the idea of putting a mini tree in a tin! 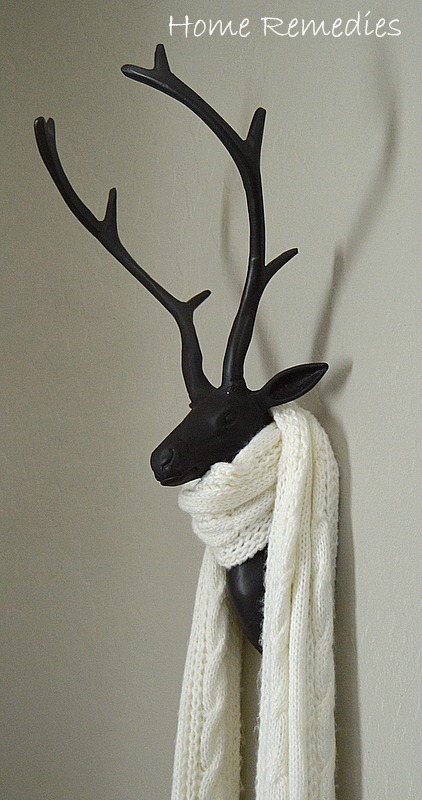 I also love how you put a scarf on your deer head. Thank you, Carrie. I’ve had the metal tub just hanging around for about 6 months – it was nice to finally find a way to use it! And the deer just looked a little plain – so I dressed him up a bit. Thank you for stopping by to visit! Absolutly gorgeous, as always Amy!!! 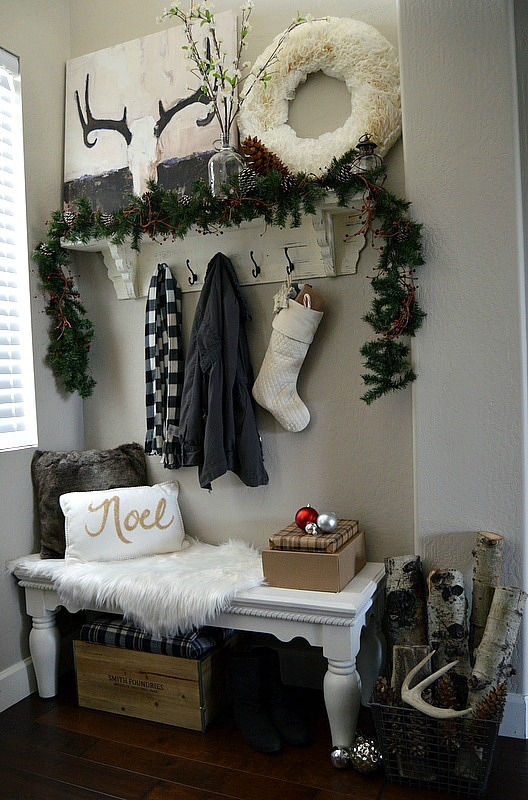 Your entryway is SO inviting and cozy! And I looooove your sidetable all dressed with that chalkboard. Your daughter is seriously talented! And your tree is so pretty! So glad we got to do this home tour together! Thank you Amanda! 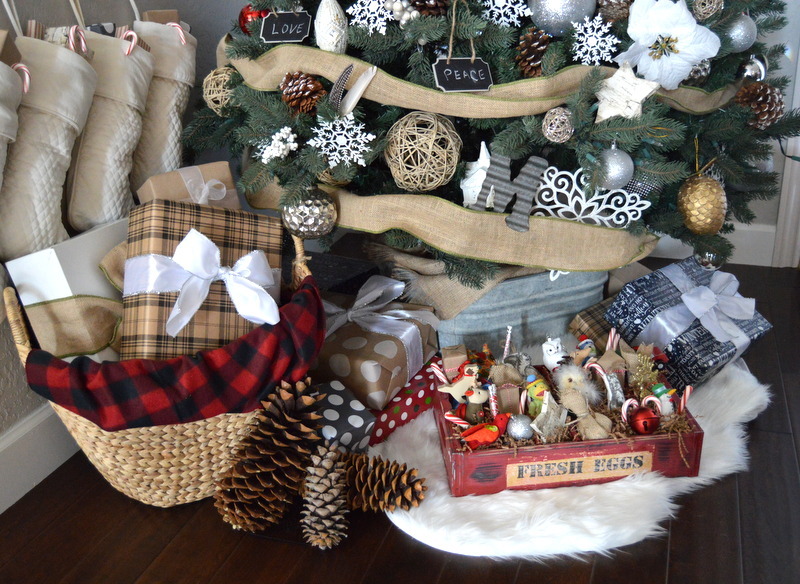 I love decorating for the holidays – it’s one of my favorite things to do! I’m so glad we got to do this tour together, – it’s been fun! Thank you, Lindi! I wish I would have stocked up on that paper, I can’t seem to find it anymore Thanks so much for stopping by! Simply Wonderful! I can not get enough of your entryway. so stunning! Can’t wait to see more! Thank you, Emily! You are too sweet! Thanks so much for stopping by! your home is just lovely. 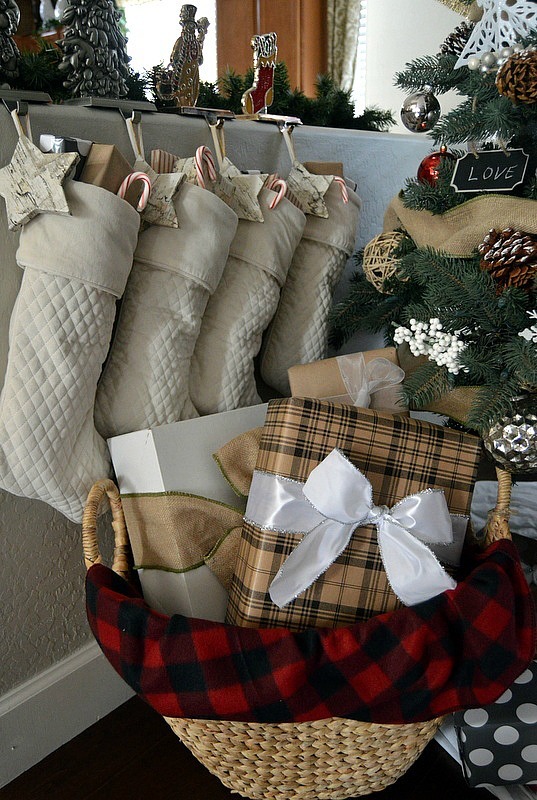 everything is so warm and cozy and perfect for the holidays! laura@top this top that recently posted…Oh Yes I Am….Gonna be a Better Baker! Thanks so much, Laura! I appreciate your sweet comment, and I’m glad you stopped by! Thank you, Melanie! I’ve had a great time “touring” with you, too! Thanks so much for stopping by! I just recently came across your blog by following a link to a holiday home tour and I love it!! 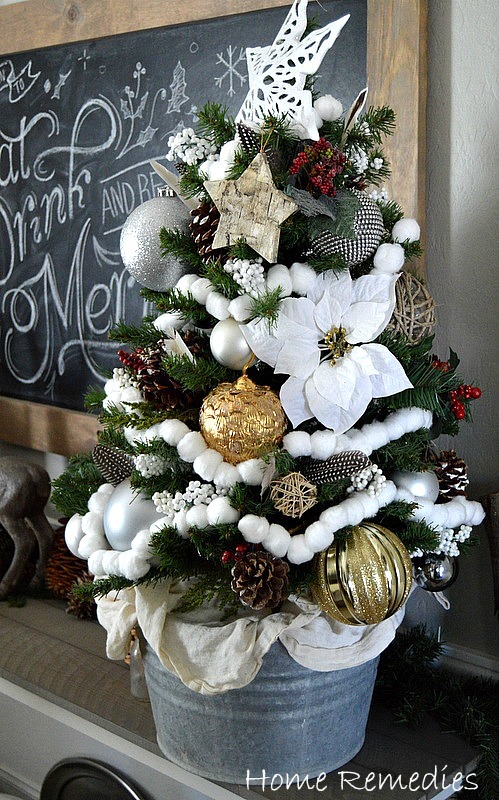 You have so many great ideas to share, especially your Christmas decorations! Your home is decorated simply, yet it is so beautiful and inviting! 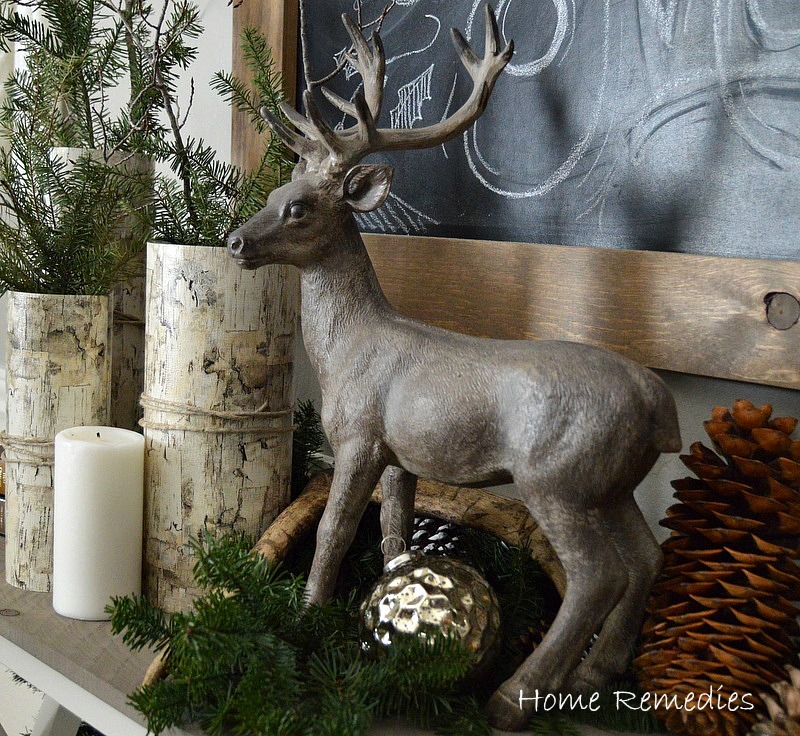 I love the rustic/woodland decor and am already thinking I’d like to do that next year. =) Thanks so much for sharing….I’m looking forward to more holiday ideas! Thank you so much for the sweet comments, Lanita! I’m so glad you stopped by! I’m all about simple, functional, inexpensive, yet pretty home decor! Your home is absolutely perfect. You’ve added little Christmas touches throughout the entire house and I love it all! The writing on your chalkboard is amazing and I’m in love with the pinecone pillow on your couch. I’m sharing this post as one of my favorites tomorrow at our party! Thank you so much, Jamie! I’m heading over now to link up my latest! Your home is gorgeous!!! So inviting! Could you please tell me where you purchased your white bench that’s in your entrance? I’ve been searching for one just like that. Thank you! Thank you so much! The bench was actually a sofa table that hubby and I cut down into a bench. It was given to us by a friend. So sorry I couldn’t be more helpful. Love your entry- it’s my inspiration to decorate our guest room man cave/chic Where did you find the deer skull painting? Hi Cori, so glad you like my entryway! I found the painting at my local grocery store (Kroger), but I haven’t seen it there since. World Market also carries it, and you can order online if you don’t have a store near you. Hope that helps! I love the way you change out the entryway for the seasons. I also like the gray paint color. What is the brand and name of paint that you used? It’s perfect! Hi Candace,thank you so much for your sweet comments! The paint color is Revere Pewter from Benjamin Moore. Hope that helps!